house of spoon: apron addict? well after never having worn aprons in the good old days of the motherland, SuperD requested another one after my fabulous superhero one was such a success....it seems he didn't know what he was missing!!! Well the hilarious chef hat was my idea (obviously) and when I ran in with it on saturday morning where SuperD was doing his daily exercises (bench pressing the guest bed, on this occasion...lol seriously!) he burst out laughing and nearly rookied himself as he was supposed to be stretching!! hehe it was totally worth it!! This totally rocks! 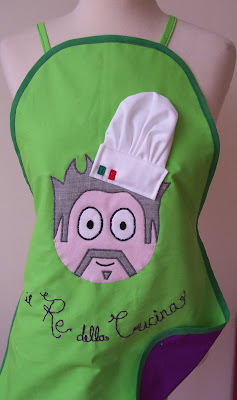 (Definitely, you must open an apron shop) I've never laughed so much at anything- maybe because it is so realistic!! "the king of the kitchen"!! it also could mean "the king of cooking"
or "the king of cuisine"